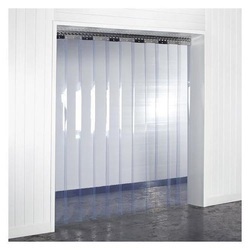 We are offering a wide range of PVC Strip Curtains , which is widely used in industries for keeping out the cold and hot air, hot air, dust, smoke, noise, harmful fumes, insect out of the place. 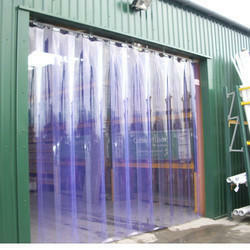 Further, these PVC sheets save power because as they do not contain electric drive. 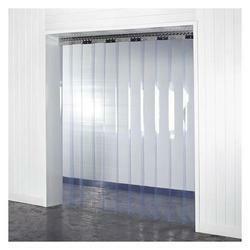 Our company is engaged in providing designing and installation of clean room curtains and enclosures. These enclosures are manufactured from a variety of strip types including anti static PVC which prevents static build up and discharge. Our range is usually floor mounted or ceiling mounted and also available in both. We are engaged in providing PVC strip curtains, which remains highly soft even at 50 Celsius below zero, allowing easy passing of people, vehicles and goods and effectively preventing loss of cold air. 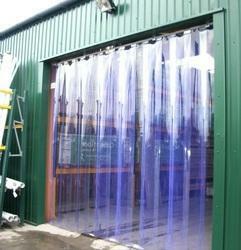 These PVC sheets save power because as they do not contain electric drive. Further, the door curtain do not have action component and do not produce noise during service. Our range of clear view transparent PVC is manufactured using quality raw material and advanced technology, to ensure high performance and long working life. These have a specially designed top allows the sample to be poured accurately, with little or no splashing. PVC being very rigid, it stays straight and never bends or distorts under normal care. PVC naturally sinks in water, due to its specific gravity, relative to water and it does not require weights to restrict flow of sample entering and exiting bailer. 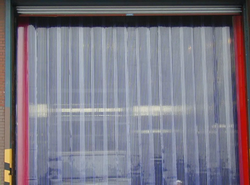 We are engaged in providing Polar PVC strip curtains, which remains highly soft even at 50 Celsius below zero, allowing easy passing of people, vehicles and goods and effectively preventing loss of cold air. These PVC sheets save power because as they do not contain electric drive. Further, the door curtain do not have action component and do not produce noise during service.